"The greatest miracle ever performed by Jesus was not in controlling the angry sea but in disciplining his own will ... What a tremendous benefit we could bestow upon ourselves by calling off the war and learning to live at peace with God, not only in obeying him but also in agreeing with him." God's requirement that we surrender our will to His, is asking a lot. C. S. Lewis and Neal A. Maxwell have both weighed in on this with their usual eloquence. But though the Lord asks everything of us, He has promised us much in exchange. Periodically we all find ourselves in defiance with God. Though we may find ourselves surrounded by many like-minded souls, ultimately it's how much we share in common with God the matters most. One of the first steps in creating a lasting peace with God is deciding to "lay down the weapons of [our] rebellion" (Alma 23:7) and surrender to God. It is not sufficient to just walk away like some Zerahemnah. The gesture must be accompanied with a willing mind and followed by humble obedience. This may take a while. 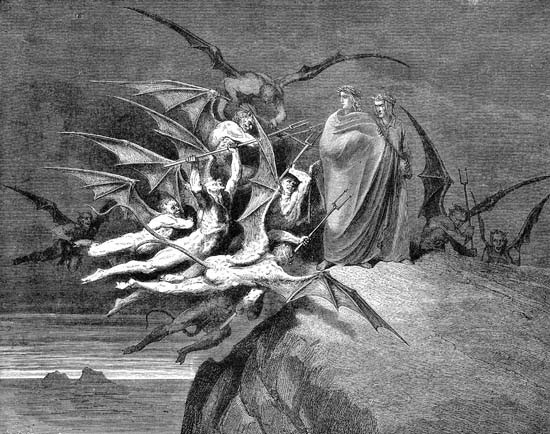 Image: Illustration from Dante's Divine Comedy by Gustave Gore.